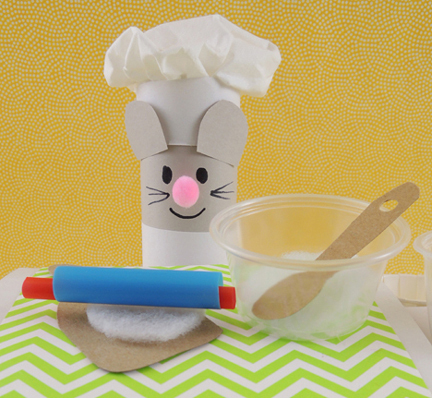 Let this Sous Chef Souris help you make delicious pies! Your miniature kitchen has everything you need for creative baking – mixing bowls, wooden spoons, cutting board, rolling pin, pie pans, fresh felt ingredients, and, of course, matching chef hats! We read Tiny Pie, written by Mark Bailey and Michael Oatman. Illustrated by Edward Hemingway (Running Press Kids, 2013). It’s past her bedtime, but little Ellie the elephant is hungry. She’s too short to reach the kitchen counters or open the fridge, but she can peep through that interesting mouse hole in the wall. There, she discovers a mouse cooking show in progress inside, complete with cameras and studio audience. 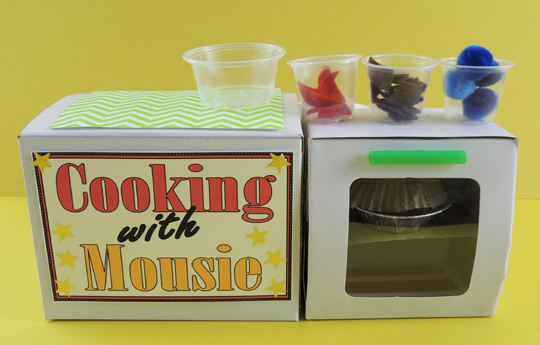 It’s tiny pies, big flavor, for Ellie and her new mouse friends! The cooking counter consists of 2 parts. 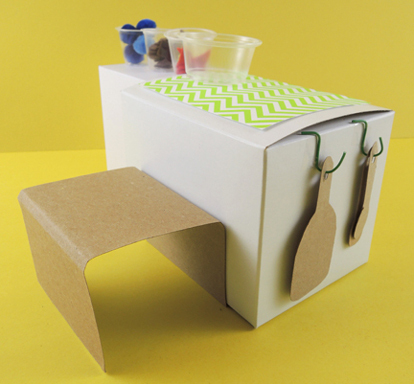 Part 1 is a 6″ craft box work counter (that’s where the sign template goes – don’t forget to add your name to the sign!). Part 2 is the oven. 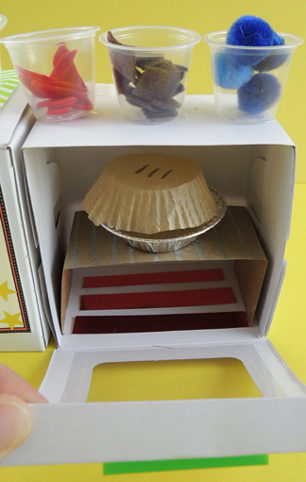 We used a 4.5″ “White Cupcake Box” from Oriental Trading Company ($5 a dozen) as our oven. Why? That cute little window in the top! It makes a perfect oven door. Add a 2″ bit of drinking straw as an oven handle, and you’re ready to bake! On top of the cooking counter is some patterned paper, as well as 4 clear plastic sample cups. 3 of the cups were stocked with pie fillings: red felt apple slices, brown felt chocolate, and mini pom-poms blueberries. The 4th cup is the mixing bowl. To give the mouse chef a little boost, we had to add a tagboard “stool” to the back of the cooking counter. You can see it in the photo below, along with some twisteez wire hooks we added to the sides to hang your utensils (you can also use paper clips). The cutting board and wooden spoons are tagboard. The knife is a little piece of silver mirror board with a black masking tape handle. 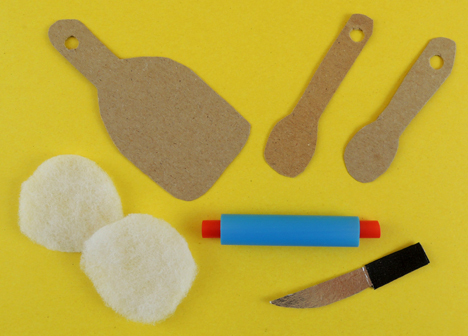 Those two white circles are polyester batting “pie dough” for the mixing bowl, and the rolling pin is a 2.25″ snippet of bubble tea straw with a 3″ piece of drinking straw threaded into it. The pies are mini aluminum pie pans with a circle of fabric batting dough tucked in the bottom. Top if off with some felt or pom-pom ingredients. 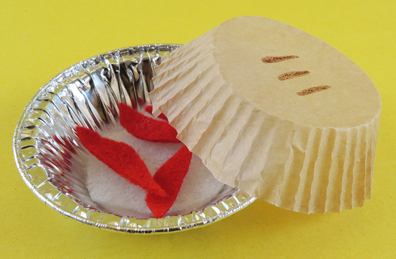 The crust is a trimmed-down muffin baking cup top. 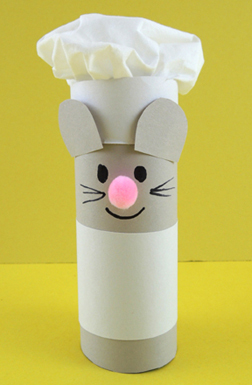 The toilet paper tube mouse is sporting a chef hat made from construction paper and a bunched up facial tissue. 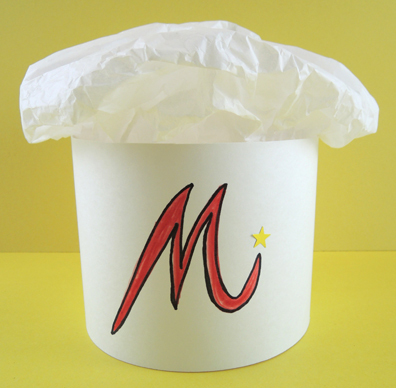 Your chef hat is made out of cardboard and white tissue paper. Instructions for making it can be found in this post. It only occurs to me now, looking at the photo. This chef hat TOTALLY needs a pair of grey construction paper mouse ears. 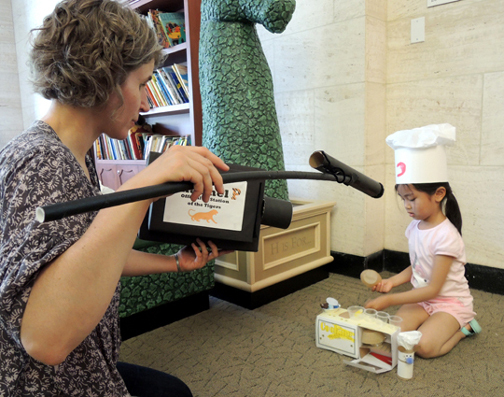 When the kitchens were finished and the chefs were ready, we brought out our camera equipment (learn how to construct it here) and filmed a number of pie-themed cooking shows. Chocolate appeared to be the pie flavor of the day. And with good reason, amiright? Nom nom.